Blake Wheeler passed to Ben Chiarot on the left wall. Chiarot carried the puck down to the bottom of the left circle before sliding a pass to Mark Scheifele at the top of the crease. Scheifele fired it over the glove of Mike Smith and in. While shorthanded, Elias Lindholm carried the puck down the right side into the Jets zone, passed to a trailing Mark Giordano, who gave it back to Lindholm in the right circle. Lindholm sent a pass to Mark Jankowski at the top of the crease and he redirected the puck past Connor Hellebuyck and in. While on the power play, Kevin Hayes sent a pass back to Tyler Myers, who snapped a shot that was stopped by Mike Smith. The rebound dropped at the top of the crease and Mathieu Perreault lifted a backhand over Smith and in. Improve to 24-9-4 at Bell MTS Place and finished their three-game homestand at 2-1-0. 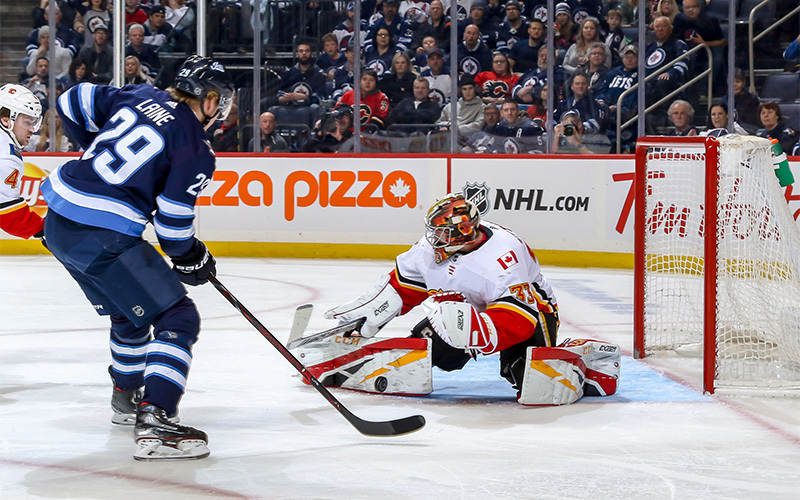 Jets penalty kill went a perfect 3-for-3 tonight and are now 13-for-13 in their last five games against the Flames. With the Jets win, the home teams have now won 10 of the last 13 games between the Flames and Jets. Improve to 17-6-4 in one-goal games this season. Improve to 21-4-3 this season when leading after the second period. Improve to 26-8-3 this season when scoring first. Assisted Mark Scheifele’s goal and has an assist in every other game since Feb. 22 at VGK – a span of 11 games. Tied for the team-high with five hits tonight. Was assessed a minor penalty in the first period to reach 100 penalty minutes for his NHL career. Won six-of-nine (66.7%) faceoffs tonight. Scored in the second period and has three goals in his past four games. Registered his third game-winning goal of the season. Scored his team-leading 34th goal in the first period and has scored in back-to-back games. Led the Jets with three shots tonight. Assisted Perreault’s second period goal and has four assists in his past five games. Led the Jets in ice time tonight with 24:16. Notched his team-leading 67th assist in the first period and is one assist away from matching a career high for assists in a season. Has a point in 53 of 71 games he’s played this season. Stopped 27-of-28 shots to pick up his 30th win of the season and improve to 30-20-2 on the year. It’s the 11th time this season Hellebuyck has allowed just one goal in a game.